Oh, he had walked the walk. A blue collar pencil pusher by day. He knew the in and outs of the corporate shell. Nailed the daily punch card and had a perfect record. He would speak when asked and worked hard to achieve goals set by those in charge. A dedicated company man. A company man dedicates his time and effort to help keep the status quo by doing his part Never causing ripples to upset the boat. Just remain a steady hard edged cog in all that keeps the company moving forward. Monday through Friday. Even at his clean desk he did not have any distractions, unlike his co-workers. No radio or personal desk calendars or family pictures. The higher ups liked that, in their mind it kept him focused. Friday would arrive and the seeds of an approaching weekend would sprout throughout the office. BBQ’s, soccer /basket ball/football/hockey games. A gathering of co-workers at Benigan’s and knock a few back to start the weekend. He always turned their offers down, he had other plans. As his co-workers left in their shiny new cars and SUVs, He gladly climbed behind the wheel of his trusty 1989 Dodge truck and headed west, his heart and mind focused on his other office which waited. Friday nights are all about prep. Tear down and rebuild. Planning, strategy. Dirty Johnny watches the weather and working with Woody, determines sparkplugs, fuel/air ratio, tire pressure. Knowing. The brothers discuss the barometer and weather for the next day. Dirty and Woody come to a decision and reassemble the smallblock. Ol’ Skinny, well, wise as he is, just watches. Knowing. And as the moon rises and the digger is prepped and ready for Saturday, revelry in the pits is not too uncommon, and the first of many of Golden’s finest is emptied. The morning sun blasts the pits with warmth. The temperature creeps as the asphalt gets softer. Skinny is resting on a stack of racing slicks. Late night combined with an early morning. Through the fog of a night’s good time the team works. A mild throb in the skull, but the boys have work as one. A unified machine of a hidden teamwork. Dirty Johnny casts a glance to the horizon. Then looks at his watch and studies the track thermometer. “Hmm.” He knows that their time for their first run is not for an hour, but if the conditions are just right. The pits are strong with the smell of racing fuel. Alcohol. Nitro. Skinny suits up and Woody tends to the tow straps. Dirty climbs into the Dodge and eases the pick up forward. The soft breeze calms and the weather balances. Still. No wind. Dirty Johnny raises an eyebrow. The launching of a dragster is all about a check list. Woody had lived it since he was only as tall as a racing slick. Everyone tending to the launch has a job to do and most important is the communication with the driver. Fire up, tow straps disengaged, chute straps pulled. Every detail ran through like clockwork and then it was all up to Skinny. A quick burn out, heating the tires up. Not too much. Guided back into place and then he rolls forward slowly and the Christmas tree lights up that he has pre-staged. Now he is staged and it begins. Yellow. Yellow. Yellow. As the yellow light fades he stabs the throttle. A weeks worth of sweat and prep comes down to a millisecond as his reaction time is .499. Green flashes by and he feathers the throttle. No tire spin, and the small block screams. And it’s done. 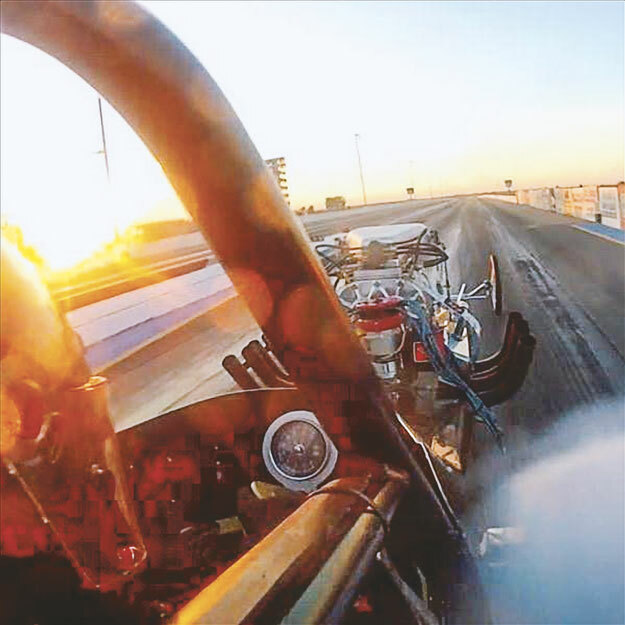 He pulls the shoot and coasts..drag chute slowly pulling the dragster safely to a stop. Numbers flash across the display board. 6.1 201.54. The crowd howls. Skinny Jim pumps his fist and whoops. Just another day in his office. Written for my friend Skinny Jim O’Connell. Happy Birthday, man.